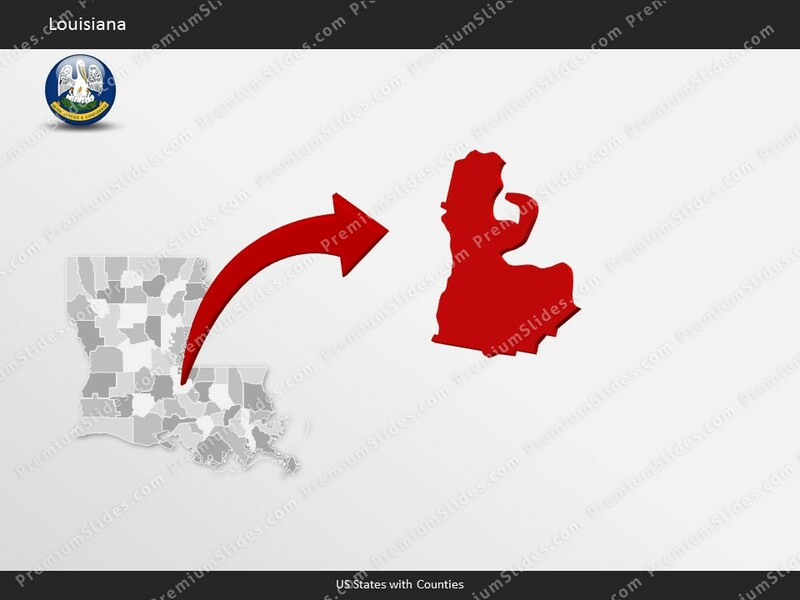 Premium PowerPoint Map of US State Louisiana. 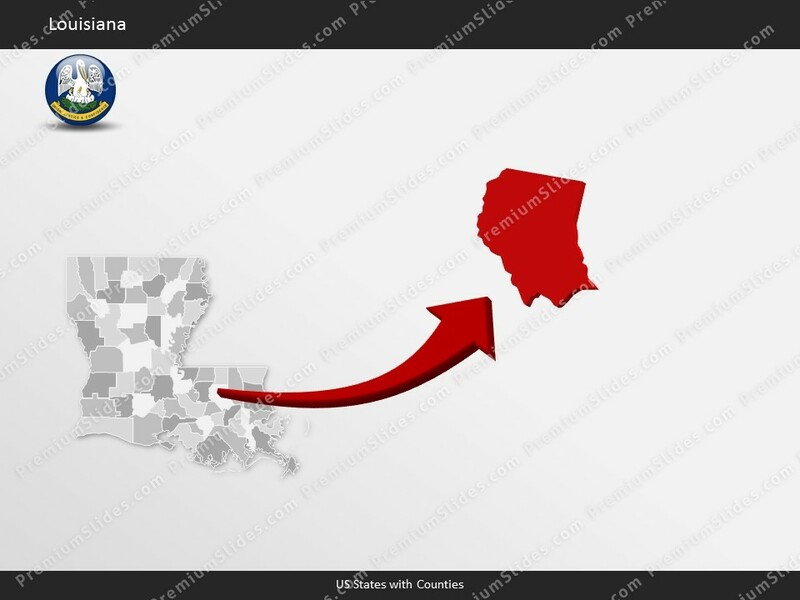 This detailed PowerPoint Map Template shows Louisiana counties, county names and biggest cities including the Louisiana state capital. 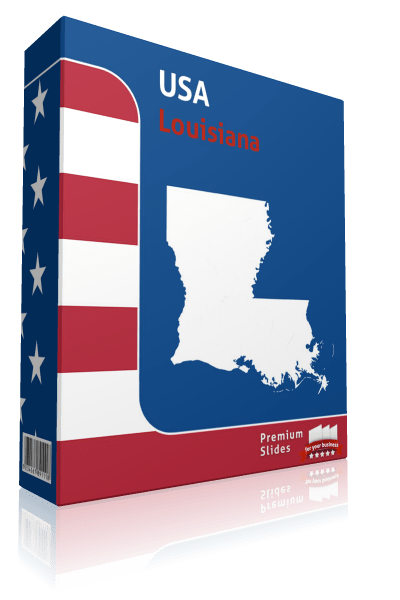 Premium PowerPoint Map of US State Louisiana. 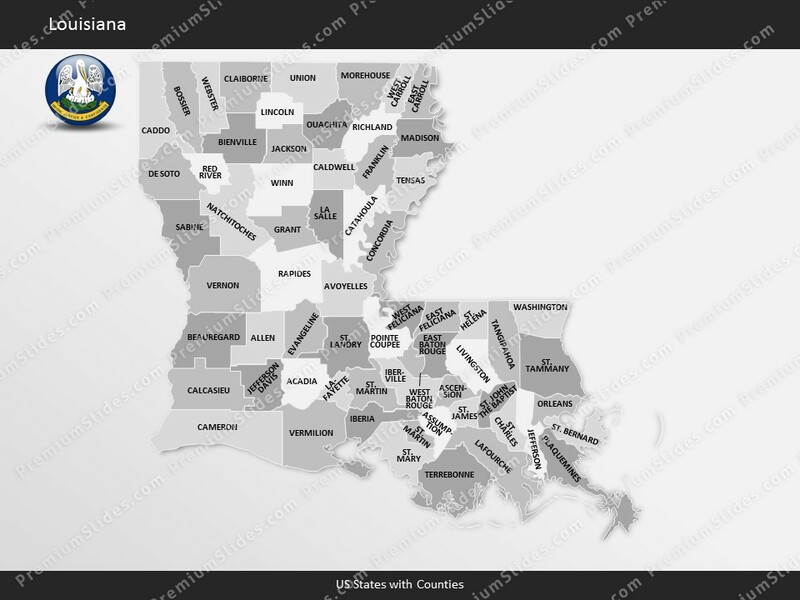 This detailed PowerPoint Map Template shows Louisiana counties, county names and biggest cities including the Louisiana state capital. 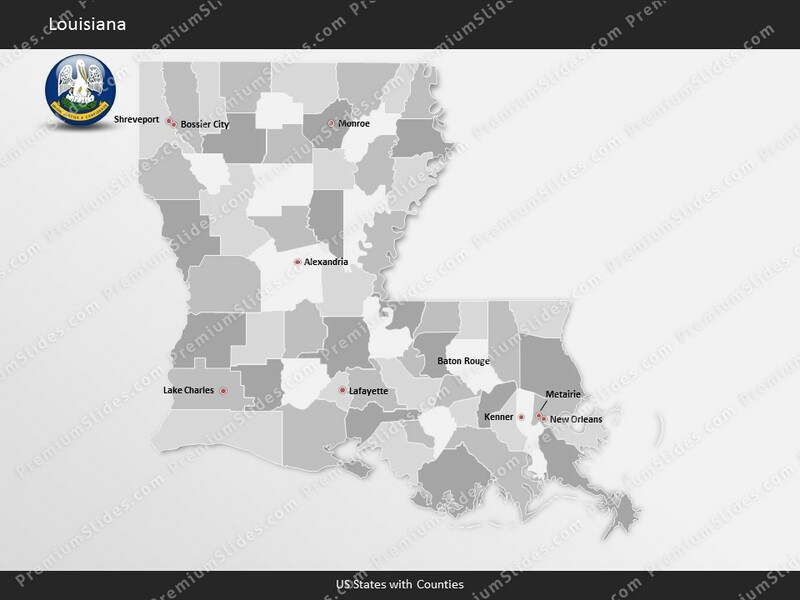 The Louisiana PowerPoint Map is hand drawn and fully editable in size and color. Specific territories can be highlighted easily with just 2 clicks in PowerPoint. The Louisiana Map Template is a great benefit for showing sales data in this state. Do not wait! 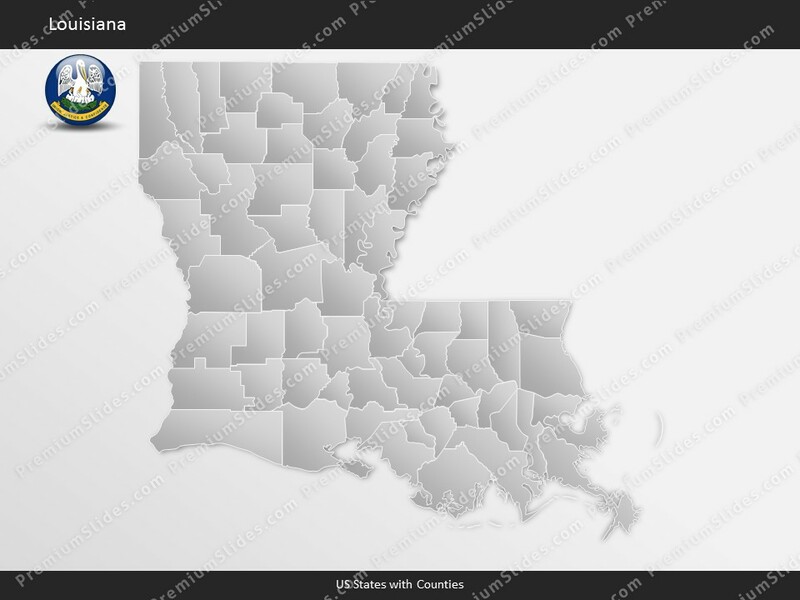 Get this Premium Louisiana Map Template for an unbeatable price today and impress your audience in your next meeting! Facts and information about Louisiana State you can use in your presentation. 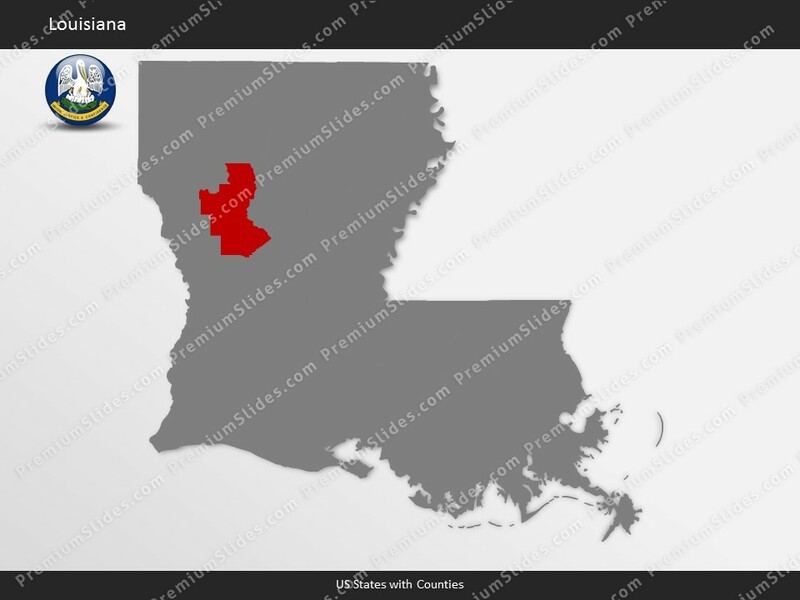 Louisiana (LA) is also known as the Pelican State. The name Louisiana is in honor of Louis XIV of France. The date of admission to the Union was on April 30, 1812 out of Territory of Orleans. It is the 18th state to joining the other constituent entities. The motto of the state is: Union, justice, and confidence. The total size of this US State is about 51,988 square miles. Therefore Louisiana ranks in 31st place among all other US States in terms of land area. Actually 43,199 square miles are covered by land and 8,789 square miles are covered by water. The mean elevation is 100 feet. Louisiana's highest point is Driskill Mountain with a height of 535 feet. The lowest place is New Orleans, which is -82 feet. Its geographic center can be found in Avoyelles Parish, 3 miles southeast of Marksville. Louisiana is bordered by the following states: Arkansas, Mississippi, Texas. In 2015, 4,649,676 people lived in Louisiana. The majority of people do not live in the capital Baton Rouge. They live in the largest city New Orleans. The residents are called Louisianan, Louisianian. Louisiana is known for these industries: Chemical products, petroleum and coal products, food processing, transportation equipment, paper products, tourism. Louisiana is significant producer of agricultural products, including Seafood, cotton, soybeans, cattle, sugarcane, poultry and eggs, dairy products, rice. Louisiana belongs to the region of the Southern United States. As reported by the Census Bureau the Southern United States commonly referred to as the American South, Dixie, or simply the South, is one of the four geographic regions specified . The accepted definition includes 16 states. Due to the size of the population in this region, estimated to be about 114 million, the Census Bureau defined 3 smaller sub-regions. The South Atlantic States including Delaware, Florida, Georgia, Maryland, North Carolina, South Carolina, Virginia and West Virginia; The East South Central States consisting of Alabama, Kentucky, Mississippi and Tennessee; and The West South Central States comprised of Arkansas, Louisiana, Oklahoma, and Texas. Many of the biggest US enterprises are based in Atlanta and the surrounding area. These businesses include The Coca-Cola Company, The Home Depot, Delta Air Lines and also some of cable television networks, such as the Turner Broadcasting System (CNN, TBS, TNT, Turner South, Cartoon Network), and The Weather Channel. As a result of the reduced company tax rates and the low cost of living, a number of companies have moved to the South. Today many Fortune 500 companies are based in this region. That's why the South has some of the lowest unemployment rates in the United States.